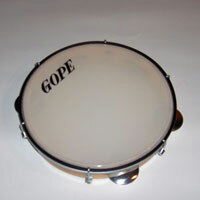 The pandeiro is a single goat or plastic skin hand drum, with a cylindrical wooden or formica shell, very shallow but quite large (sometimes called "frame", from 8 to 12 " diameter) with holes receiving steel or copper "cymbalettes". 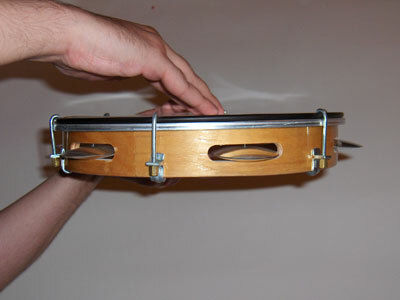 Frequently used to accompany capoeira (a kind of martial dance practiced by rebel slaves originally) and the berimbau (musical bow), the pandeiro was adapted to a lot of kinds of song accompaniment by imitating a full batucada, because its low sound power blends with the vocals and acoustic guitar, joining its European origins of the "troubadour" accompanying himself with tambourine. The difference with the latter is that it has only one row of "cymbalettes" (jingles) and they mute themselves in the manner of a hi-hat, thanks to their rounded shape. This latter feature allows to highlight more its drum qualities than the "shaker" (some modern tambourine are on the opposite with no skin, which put it closer to the Brazilian chocalho, a kind of "wand with cymbalettes "). 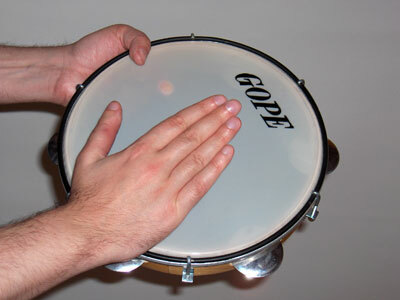 It is held with the whole hand in the place with no cymbalettes (left hand) thumb up, on the skin, and struck alternately with the thumb (intermediate position on the skin, with the more resonant tone: "open tone"), the other fingers (center of the skin, the resonance is muffled by bounce of vibrations equidistant from the edge) and the palm (edge ("rim") of tambourine, at the shell, with no resonance skin at all, only the cymbalettes) of the right hand. 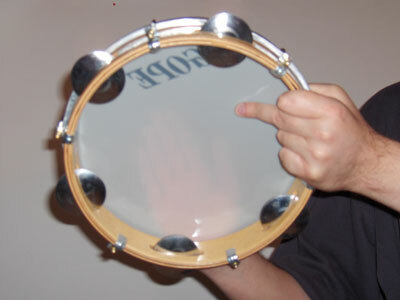 You can also use a finger of the left hand (the middle finger), to muffle or not the resonance of the skin and change its tone by pressing it against the skin underneath (in the manner of the cuica). The position of the skin can be almost horizontal or vertical depending on the comfort of the player (the diagonal is the most natural position). The left hand can accompany the movement of the right hand antagonistically, as if one hand struck against the other, but with a swinging motion generated by the wrist symmetrically to the right hand (advanced optional technique, which can improve the strength and endurance, exploiting the effort of both hands). 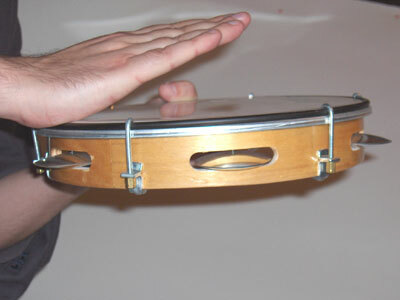 The pandeiro generally imitates an instrument (or even sometimes 2) by reproducing the melodic structure of its basic typical pattern with the skin, while maintaining a continuous flow of notes with the cymbalettes in the manner of a chocalho or a ganza. This can be done only with a clever combination of the different strokes described above. c = palm (only the cymbalettes). 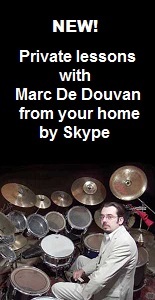 Click on a pattern to hear a demo played by Marc de Douvan (right-click and select "save target as" to download the file). a'bcbabcb (accents can be introduced with the fingers; examples: a'bcb'abcb, a'b'cbab'cb). a'bcbabab, or a'bcbaacb and a'bcbababa'baba'bab. abcabcab (you can introduce mufflings or accents ad lib (a 'or b') typical examples: abcabca'b, or abcab'cab (samba " funky "), and abca'bcaba'bcabca'b and also abcabcaba'bca'bca'b). Caixa doubled (twice slower or twice filled): abcbcbabcbcbabcb, same with accents inserted : abcb'cbabcb'cbabcb. a'cb'cab'cb'a'b'cb'acb'c ou a'cb'cacb'ca'b'cb'ab'cb (can be combined with 2 "pandeirists"). Example of variation of the previous: cb'cb'aabaacb'caaba. 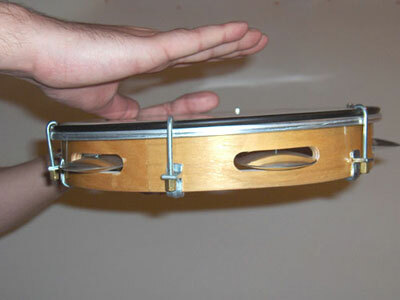 Standard variation (similar to surdo) abcaabca. abcabcabcabcabc... (Can be used as accompaniment in ternary measure). Same reset every 16 strokes (4/4 measure): abcabcabcabcabca. (Example with tone change: a'bcabca'bcbabca'bcabca'bcabcba'bcabc). Improvisation: Mastering the preceding patterns is an excellent base of exercises and modules to combine ad lib to access to improvisation while keeping a Brazilian "character". Marc De Douvan, October 2005, translation in English: May 2013.